Since there is trade and variety , man has been attracted to the concept of exclusivity. Feel that we are better or more powerful by owning something rare, unique. That glitz and glamor that provide premium products. The Gin PLATINUM GOLD joined with Vin Doré 24K , creator of one of the most glamorous drinks in the world , to produce the best London dry and exclusive gin , gold 24K incorporating powder remains in suspension for more than 30 minutes in the bottle and indefinitely in your glass . The Vin Doré 24K gold cellar is a product that unites luxury, pleasure and gastronomy. Since there is trade and variety, the human being has been attracted by the concept of exclusivity. Feel that we are better or more powerful by owning something uncommon, limited to the majority. That chic point that Premium products provide, giving us a touch of glamor that elevates our ego and distinguishes us. In Vin Doré 24K we give you the opportunity to buy champagne and sparkling wine with 24K gold powder to delight you with the exquisiteness of its essence and flavor. Cava or sparkling with gold dust, which will dance in your glass forming a perfect communion between glamor, elegance and good gastronomy. From the combination of glamour and gastronomy emerges one of the most luxurious pleasures to delight sybarites, Vin Doré 24K, with its exquisite scent and taste. Our products have been previously treated with religious care under the traditional method Champenoise. The caves temperature and silence are the catalysts of their best scents and tastes. There are few elements more luxurious and glamorous than gold. We are used to seeing all kinds of products made or decorated with gold, but now you can also eat and drink. 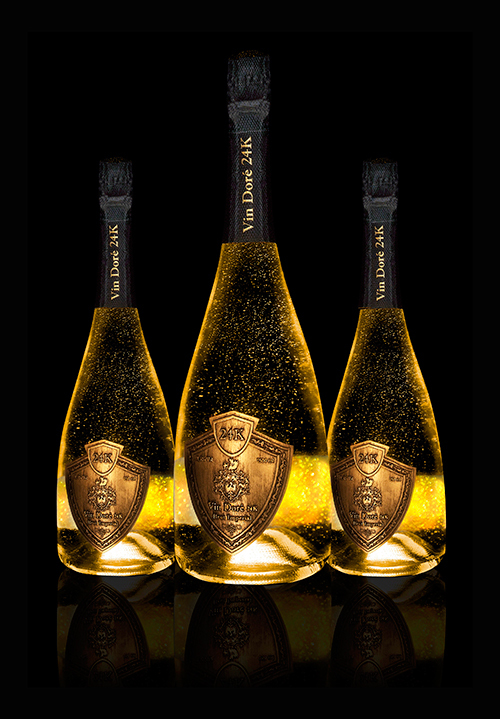 For example, Vin Doré 24K offers wines with 24-karat gold dust in suspension. “I went to a fair in Japan where we they gave sake with gold, the gold that was included was very solid, losing all the glamor that they wanted to give “, explains Diego Suárez, president and founder of the company. He got down to work and in 2008 he started working on the patent for the gold dust he uses in his wines. Four years later, he launched a sparkling wine and sparkling wine with this precious metal onto the market. “We are the only company that manages to keep the gold powder in suspension in the bottle for more than eight minutes and indefinitely in the glass,” says Suárez. In addition, it is a product with a bottle and a packaging with a very careful design. For example, the label of its cellar is made in tin and carved by hand. The care also comes to the elaboration, because the company chooses only grape with the desired quality to produce its wines and it is collected at night, looking for the best conditions. Also, the degollado of the bottles, one of the steps in the process of elaboration of the cava, is done manually. His brut has reached 91 points in the Peñín Guide.